Choosing a vehicle that suits your lifestyle and life stage is an important consideration when you're shopping for a new car or truck. Thinking about how your life may change change during the time you own the vehicle and making an informed choice are always important considerations with a high-cost purchase, such as a new vehicle. As part of our 2017 POPSUGAR Insights Auto Report, we surveyed over 1,200 US millennial female in-market auto shoppers to tell us the size and vehicle type they are considering for their next purchase. Overall, 51% of millennial women are considering a midsize vehicle, 30% are considering an economy or compact vehicle, and 19% are considering a large or full-size vehicle. For those millennial women who already own a vehicle, 36% say they are considering a differently sized vehicle from the one they currently own, and 34% are undecided about the size of vehicle they plan to consider. For an audience that is maturing and moving into a new stage of life, sedans and SUVs are very popular. 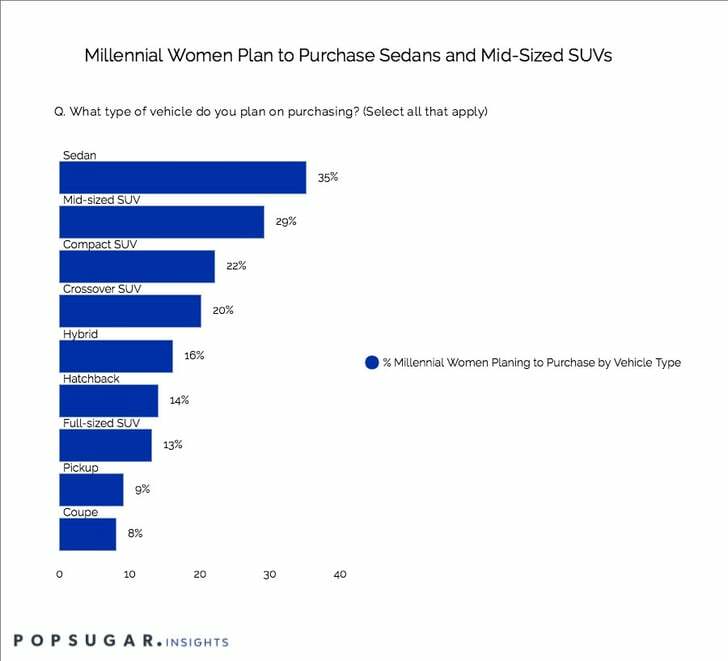 Thirty-five percent of millennial women plan to purchase a sedan, and SUVs take up three of the top five and four of the top 10 vehicle slots overall. Midsize SUVs (29%), compact SUVs (22%), and crossover SUVs (20%) rank second, third, and fourth, respectively, while full-size SUVs rank seventh overall. Hybrid vehicles (17%) round out the rank of top vehicles, coming in fifth overall.